We’d love your help. Let us know what’s wrong with this preview of A to Z Flashes of Foxwick by Cherie Reich. Draw back the curtain and glimpse the extraordinary world of Foxwick and their neighbors! Magical creatures abound. A phoenix flies proudly while a little dragon makes a new friend. Siblings fight and let their magic light up their lands. A future queen's love can turn a man's heart to ice. Lady Death meets an unusual companion and more stories from the kingdoms of Foxwick, Wintermill, Valdale, and Lochhollow. These twenty-six flash fiction fantasy pieces will take you on a journey through the alphabet and to faraway, magical lands. To ask other readers questions about A to Z Flashes of Foxwick, please sign up. A wonderful collection of flash fiction! This book makes for a fun, bite-sized introduction to the world of Foxwick. I especially love the assassin princess and what she becomes. I'm excited to read the next one! I don't believe it's too much of a stretch to imagine Cherie Reich as a child, under the covers after lights out, a flashlight trained on Lewis Carroll's Alice in Wonderland and her mind completely involved in the conversation between Alice and the Mad Hatter. Or that Ms. Reich still occasionally slips into another dimension where she enjoys a rich life in the otherworlds of her imagination. The idea for A to Z Flashes of Foxwick is the result of Arlee Bird's Blogger Challenge where bloggers were challenged to write succeeding blogs featuring the alphabet letter of the day posted on the contest blog. Ms. Reich accepted the challenge and wrote 26 blogs using each letter of the alphabet in a series of flash-fiction stories about the Kingdom of Foxwick, its inhabitants and its neighboring lands. “Sparse grasses swayed like a metronome. Stunted trees, blackened from fire's fury, poked from the ground. A lizard crept over the rocks and scurried into a crevasse as the phoenix glided over Blackden Barrens. . .” Poetic prose. It's a time when fiction and reality blend into a dimension of illusions. Words melt in your mind and sentences flow into a mesmerizing sea of dreams as Ms. Reich opens the door to her world of fantasy. Hers is a world populated with dragons, fire birds, kings and queens, and ebony unicorns with silvery horns. Creatures move from her mind to the page with a childlike beauty and simplicity that ask for yet another telling of the stories. I read them twice from cover to cover. Ms. Reich's flash-fiction stories follow each other like a lustrous string of pearls until they are finally woven into the storybook that brings the vision of Foxwick to the reader's mind. The twenty-six flash-fiction stories are followed by Lady Death, a bonus short story from Ms. Reich's book The Women of Foxwick. The short story ties characters from A to Z Flashes of Foxwick to a duel to the death between lady sword-fighting assassin Umbria and Lady Death. Way cool! Beyond the enjoyment of Ms. Reich's world, the book also taught me that a flash-fiction piece of exactly 100 words is called a drabble. Just wait until I play Scrabble again! I can't imagine a young reader who wouldn't enjoy A to Z Flashes of Foxwick. A dragon eating a sheep might be too much for little tykes, so I might not read the stories to them. But, with the exception of one or two words actually common in today's media, I recommend letting young readers discover the magic and charming world of Foxwick for themselves. The ebook edition is available at Amazon.com, Barnesandnoble.com, Sony and other ebook distributors. The stories of Ms. Reich bring a dimension to flash-fiction storytelling what will surely be enjoyed by many generations to come.. A fun read. Five stars and two thumbs up! What fun doth Cherie bring! Whose tail is that waggin'? Ye olde land of the king and queen. If you're into short fiction and fantasy, like I am, this book takes a fun, experimental approach. It's a compilation of flash fiction stories about the same world from a multitude of perspectives. Each story is intriguing and revealing about Foxwick and neighboring kingdoms. I recommend for fantasy readers of all ages. Also check out Women of Foxwick and Men of Foxwick, two other compilations set in the same world. There's no better way to lose yourself in a world than with peeks into all its corners. 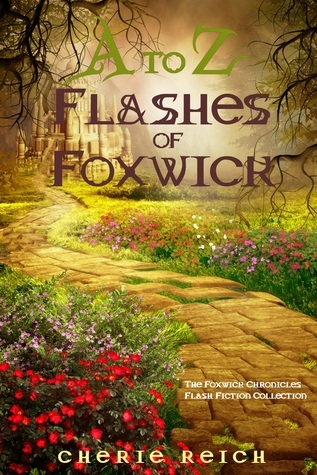 Cherie Reich does an excellent job drawing the reader into her fantasy world with Flashes of Foxwick. Each flash piece is a tasty morsel. Some with magnificent imagery, edge of your seat action, or heart-warming moments. There's fascinating characters and creatures that light up your imagination. I highly recommend this to fantasy fans. It's a great introduction to Cherie's world of Foxwick. Excellent word building and charming story telling create a fantastical atmosphere that will transport you to another world. A dragon, a phoenix, a unicorn and more magical creatures populate this fantastical collection of flash fiction stories. Each story stands on it's own, but they also tie in nicely providing clues to a well imagined kingdom. I enjoyed the Kingdom of Foxwick and its characters. The stories swept me away to another time and place. These flash fiction pieces were interconnected, but they also worked well as stand-alone tales. Cherie Reich has more books than she can ever read and more ideas than she can ever write, but that doesn't stop this bookworm from trying, even if it means curbing her TV obsession. She is a speculative fiction writer and library assistant living in Virginia. For more information, please visit Cherie’s website (http://smarturl.it/CReichWebsite) and blog (http://cheriereich.blogspot.com).